Please join Ali Naschke-Messing, Montalvo’s current Irvine Fellow at the Lucas Artists Residency Program, as she transforms the Project Space Gallery into a place of wonder and contemplation. Naschke-Messing invites the public to join her during the installation process to view and participate in the construction of a new site-specific LineWork. 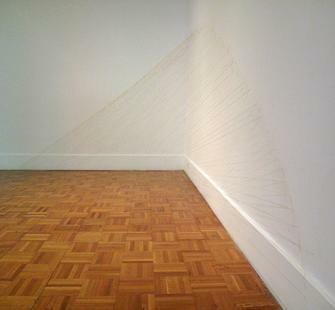 LineWorks are sculptures and installations made with common sewing thread that interact with architectural elements and human perception. They reveal an ever-present possibility of form, and hint at potential and intangible dimensions all around us. 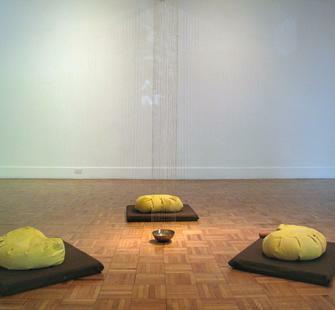 As part of the creation of the exhibition, Naschke-Messing hosted daily meditation sessions in the gallery. The meditation helped shape the LineWork. The shape developed for the space is designed for silence and openness. The philosophy of Soka Gakkai International Buddhism is rooted in the concept of "human revolution," a process of inner transformation through Buddhist practice. It is a process that leads us to develop our character and to act not only for our personal fulfillment but also for the betterment of society. 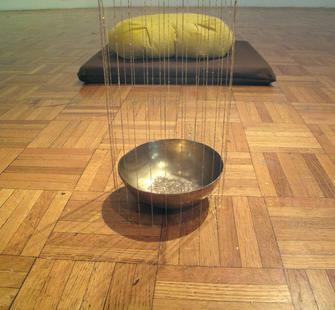 On Friday mornings, July 16, 23, and 30, from 7:45am-8:15am, Amy Caterina will be leading a meditative chant of Nam-myoho-renge-kyo in the Project Space Gallery. Also known as Daimoku, chanting enables all people to perceive this Law in their own lives and to come into rhythm with it. By putting their lives in harmony with this Law, people can unlock their hidden potential and achieve harmony with the environment. On Monday mornings, July 19 & 26 and August 2 & 9, Julie Thorne will lead silent meditative sittings in the gallery from 7:45am - 8:30am. The gallery will be open until August 15; regular gallery hours are Thursday - Sunday, 11am - 3pm. Visit our Facebook page for this event - become a fan, and RSVP!